We’d love your help. Let us know what’s wrong with this preview of The Storyteller by Evan Turk. Long, long ago, like a pearl around a grain of sand, the Kingdom of Morocco formed at the edge of the great, dry Sahara. It had fountains of cool, refreshing water to quench the thirst of From Ezra Jack Keats 2015 New Illustrator Honor recipient Evan Turk comes his debut work as author-illustrator: an original folktale that celebrates the power of stories and storytelling. To ask other readers questions about The Storyteller, please sign up. Credit the internet age for doing what the television age never could. I don’t know if you’ve noticed, but there is a movement around the world that can be interpreted as nothing so much as a direct response to our digital age. You may have noticed it in small things, like the rise of Steampunk or the sudden surge of interest in Maker stations and the kinds of “hacking” that look suspiciously similar to activities found in shop class in days of yore. All this comes about because people have come Credit the internet age for doing what the television age never could. I don’t know if you’ve noticed, but there is a movement around the world that can be interpreted as nothing so much as a direct response to our digital age. You may have noticed it in small things, like the rise of Steampunk or the sudden surge of interest in Maker stations and the kinds of “hacking” that look suspiciously similar to activities found in shop class in days of yore. All this comes about because people have come to believe that we do not create enough tangible objects in our day-to-day lives anymore. And while this is true, let us not forget that we do not create enough intangible objects either. I’m talking about storytelling, that ancient artform that is currently seeing a worldwide resurgence. It isn’t just the increase in storytelling festivals and podcasts like The Moth here in the States. Young people in countries worldwide are doing what their elders have desired for decades; they’re asking to be told a story. 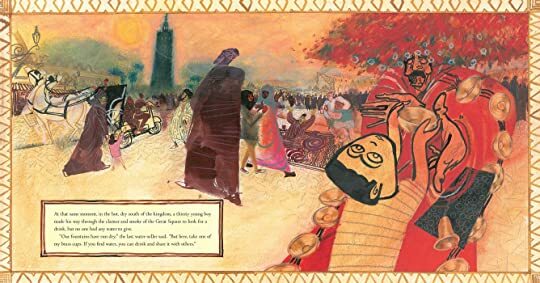 Taking his cues from the newfound interest of young Moroccans in Marrakech in the ancient storytelling tradition, author/illustrator Evan Turk uses the folktale format to craft an original story about storytelling, weaving, history, and language. The end result is a twisty turny story within a story within a story that challenges young readers even as it lures them in. Once, in the great country of Morocco, storytellers flourished and the cities’ fountains flowed with cool, clear water. As time went on the people became comfortable and forgot about the storytellers, and so they disappeared over the years. So too did the fountains dry up, until one day a boy went looking for some water. What he found instead was an old storyteller. As the man told his tale he would end his story with a story within a story and the boy would find his brass cup filled with liquid. Even as this was happening, however, a desert djinn saw the drought as an opportunity to reclaim the cities that had previously held him back with their fountains. Yet when the djinn was set to level his town, the boy managed to delay him with his storytelling. And as he wove his tale, the people were able to refill their fountains until finally storytelling and water ran freely in the cities once more. My brain is not what it used to be. Remind me again. What’s that term for a story that tells a story that tells a story that ends only when the innermost story doubles back and each tale is finished in turn? Is there a word such a thing? I suspect that the storytellers amongst us would know. The most obvious similarity to this book that comes to mind is, of course, the tale of Scheherazade. Indeed, the boy uses his stories to trick the djinn. And what could be a more natural comparison? In both tales it is storytelling that proves to be the saving of us all. Our thirst is quenched and we are tied to our history like never before. The obvious question then is whether or not Turk’s text is too complex for kids to follow. Sure, he distinguishes between the tales with different colored fonts, but will that be enough to allow them to remember what came before as they plunge deeper and deeper into the narrative? I think there may be some confusion at work, certainly. I wouldn’t necessarily hand this to a three or four-year-old. However, Turk’s text takes pains to remind the reader where the tale was before. The art helps as well. Confusion, such as it is, will be held to a minimum. I first knew of Turk’s work when he illustrated Bethany Hegedus’s Grandfather Gandhi. In that book he integrated real spun cotton threads into the art, knowing full well the importance spinning had to Gandhi and his followers. In this book, weaving is the craft of choice so I wondered, not without reason, if woven threads would make their way into the art. As it happens, there are plenty of water-soluble crayons, colored drawing pencils, inks, indigo, sugared green tea, and even art created by heat gun and fire in the illustrations, but nothing so simple as thread. Turk mentions this on his publication page and he puts a little note to the reader there as well. It reads, “Look for a blue glimmer of hope to appear around each story!” and a small blue diamond appears. Naturally, I was curious so I looked. Sure as shooting, after each story’s text a diamond appears. However, as the stories appear within stories within stories, the diamonds grow more elaborate and decorative. Then, as the stories end one by one, the diamonds simplify once more. I began searching the art for more diamonds and here Turk doesn’t disappoint. If you look closely at the borders of the book, you see that the diamonds appear when there is hope and fade from blue to brown diamonds when hope dries up. As the storytelling increases the borders fill in more and more blue, just as the townspeople fill their fountains with bowl after bowl of water. Point out to a child reader the diamond motif and you are sure to be surprised by all that they find hidden in these pages. I should probably say something about Turk’s art itself. When I reviewed Grandfather Gandhi I had difficulty putting into words precisely what Turk does with his images. So I looked at the book’s professional reviews. His art causes reviewers to use terms like “dynamic visuals”, “stylized” and “strikingly patterned”. They say his art displays “bold, expressive imagery” or that he “mixes carefully detailed renderings with abstracted expressions of emotional struggle.” I agree with all of that but no one mentions his faces and hands. The patterns here are striking and upon closer inspection they yield such marvelous details it wouldn’t take much for this art to spin wildly out of control, opting for an abstract approach to the proceedings as a whole. Instead, Turk centers his art through the hands and faces of his characters. Look closely and you’ll see what I mean. The old storyteller’s hands are gnarled and wonderfully expressive, even as his audience of one clutches a single brass bowl. The hands of a cunning neighbor stroke her child as she schemes, while a princess, escaping on the night before her wedding, holds up her hennaed hands in despair. Hands. Heads. Hearts. There’s been a lot of discussion lately about diversity in children’s literature. Specifically, some of that discussion has concerned those books written by white people about other cultures. It’s not a new phenomenon but what is a bit new is the increasing understanding that if you are going to use another culture, you need to do your homework. If, for example, you are setting a story in Morocco, then you need to make the readers understand why you made that choice. That it wasn’t arbitrary. This is yet another of the many reasons I’m so impressed with Turk’s work here. That he sets his story in Morocco (contemporary Morocco, by the look of it) is deeply purposeful. The Author’s Note at the end explains further. From this we learn that Morocco’s public storytellers or hlaykia have told tales for “nearly one thousand years” and yet “Only a handful of master storytellers remain”. All is not lost, though. Renewed interest in storytelling has surfaced, specifically at a restaurant called Café Clock in Marrakech. Turk then closes with a small Bibliography of sources on everything from storytelling to carpet weaving. The book then is not an appropriation of an “exotic” culture done on a whim but rather a considered, thoughtful selection that serves as an ideal setting for a tale about storytelling then, now, and in the future. It was once part of a children’s librarian’s training to know how to tell a story from memory. Here in America it was even considered part of a children’s librarian's heritage, though in the last few decades it has been fast forgotten. There are still pockets that remember, though. That’s why books like Turk’s give me the oddest little sense of hope. As I mentioned before, storytelling everywhere is seeing renewed interest. It seems odd to say, but this book, wrapped as it is in classic motifs and themes dating back hundreds, even thousands, of years, is one of the freshest, most timely picture books I’ve had the honor to read in a long time. Visually stunning with a storyline to match, Turk is beginning to make good on his talents. This is a man with storytelling in his blood and bones. Our children reap the rewards. A can’t miss book. In a series of nested stories, by retelling stories Scheherazade-style to a sandstorm in the form of a djinn, a boy saves a Moroccan city from being engulfed by the Sahara and replenishes its water supply. Stunningly illustrated in bold, mixed-media blending folk art and contemporary styles and full of symbolism. A beautiful picture book about storytelling as the life blood of a village. Everything about this book is beautiful. Wow, wow. First of all, Evan Turk's illustrations - which have a movement and style that are hard to describe - are rendered in "water-soluble crayon, colored drawing pencils, inks, indigo, sugared green tea, a heat gun, and fire." The plot - a bit of Scheherazade and a bit of Inception - will keep your pages turning and your brain engaged. Be sure to read the Author's Note about Morocco's public storytellers. Storytelling is the theme - told through stunning art, a visual journey and a tale that weaves into another tale into another . . . However, Turk's art style is not my favorite, and some pictures are too busy and hard to read. Also, I liked the idea and symbolism (stories can quench the thirst and save the city from the drought) of Turk's Scheherazade-like nested story and the different fonts and frames that help to track its multiple layers. However, the story itself wasn't that interesting to me. Beautiful, beautiful book about storytelling itself. As an educator and storyteller there is one moment in the 1987 film Three Men and a Baby which stands out more than any of the other, albeit, funny incidents. It focuses on reading aloud and the sound of the human voice. Do you remember this? When reading aloud to our children and students, without a doubt the words and images on the page convey more than we can fully understand given the life experiences each listener brings with them but our vocal interpretations have the ability to heighten th As an educator and storyteller there is one moment in the 1987 film Three Men and a Baby which stands out more than any of the other, albeit, funny incidents. It focuses on reading aloud and the sound of the human voice. Do you remember this? When reading aloud to our children and students, without a doubt the words and images on the page convey more than we can fully understand given the life experiences each listener brings with them but our vocal interpretations have the ability to heighten those words and images. If this is our belief, let's take it a step further to the cultural artistry of oral storytelling. There are several versions of a tale regarding the placement of televisions in the homes of an African village. Upon visiting the village an anthropologist notes the televisions have been removed from the homes and stacked in storage. When the village elder is asked why his people would give up the opportunity to listen to and view more stories than they have ever heard from a traditional teller, his reply is the storyteller knows us. The gift of storytelling is a personal connection. The spoken words are passed from heart to heart, sometimes for generations. No matter how many times a well-told tale is heard the power does not diminish, it grows. 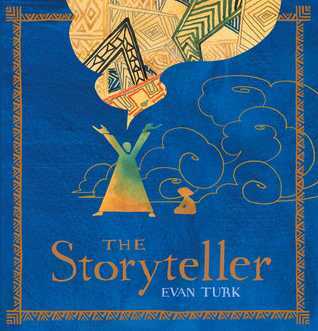 The Storyteller (Atheneum Books for Young Readers, an imprint of Simon & Schuster Children's Publishing Division, June 28, 2016) written and illustrated by Evan Turk is such a tale. On the first reading it envelopes you and does not leave. With each subsequent reading, your reader's heart expands with its power. I don't like to speak so negatively of a picture book, but I did not enjoy reading this one. I finally finished it after the third reading attempt because each time my eyes would glaze over and I would find myself very bored. The art was not appealing to me, and I found the pages entirely too busy. I couldn't put my finger on what the artwork reminded me of but after talking about it with my boss he mentioned that it looked really 90s, like when graphic arts was still developing. I agree. I don't like to speak so negatively of a picture book, but I did not enjoy reading this one. I finally finished it after the third reading attempt because each time my eyes would glaze over and I would find myself very bored. The art was not appealing to me, and I found the pages entirely too busy. This gorgeous picture book features stories within stories. In a dry desert town, a boy in search of a drink meets an old man who begins a tale that satisfies another thirst he didn't know he had. What neither of them knows is that a terrible djinn in the guise of a storm is coming and it'll take a cunning solution to keep the town safe. I absolutely loved this. Beautiful story about the power of storytelling. I wish I had a child to read it to. Morocco formed near the edge of the great, dry Sahara. 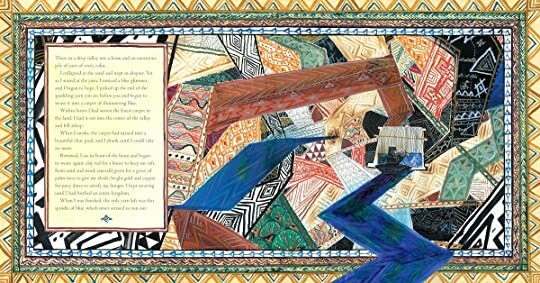 This book follows the story of a young boy in Morocco. Morocco used to flow with water until people started to forget about storytellers. The boy went to find water and instead found an old storyteller. He weaves a plan to get the water back to Morocco. I found this book extremely beautiful and unique. Not only are the images captivating, but the story reveals information about culture. Many folktales include white, european culture and characters. This book embraces the Middle Eastern culture and it’s very beautiful. I agree with both reviews in that the book begs to be looked at every inch. Additionally, I love how the book embraces storytelling and how important storytelling is. The pictures in this book are breathtaking. Every page of the book has edging detail. This book also has a very cohesive color scheme that attracts the reader. One thing I really appreciate about the book is the text is in boxes with a white background so you can read the text well. This book has great and is definitely a trickster tale which is described as a story where one character outsmarts the others in Chapter 9 of Tunnell, Jacobs, Young, & Bryan. The book has rich vocabulary and lots of room for talks of culture. This book could be connected to a mini lesson on imagery since it is so descriptive. It is definitely a mentor text since it has plenty of specific words. I think art is a great way to connect this book to other content areas. There are so many different types of lines and patterns. You could introduce Moroccan culture and art in the classroom with this book. A project based lesson around this book would be a great way to use art and teach social studies. I have read many of the classic folk tales such as Hansel and Gretel, Little Red Riding Hood, and Cinderella. However, I haven’t read many others so I was very excited to read The Storyteller. This folklore is a story of hope and will leave a smile on your face at the end of the book! The Storyteller is a folktale about a young boy living in Morocco just at the edge of the Sahara Desert. Throughout the years, the kingdom grew and the people forgot about the dangers of drought and the Sahara. Finally, the fountains in the kingdom dried up and the wind of the Sahara began to stir. A young boy went to the Great Square to look for water but instead found a storyteller. The storyteller told of the Endless Drought and a Glorious Blue Water Bird. By the end of a section of his story, the boy’s water cup was filled. The story was not yet over and the boy was told to come back the next day. The following day, he listened and his cup was full yet again. After multiple days of listening to the storyteller, the young boy learned of the hope that filled the kingdom in the story of the Endless Drought. A few days later, the sandstorm rose up and threatened to destroy the kingdom. The young boy persuaded the sandstorm to listen to the story of the Endless Drought. Once the story was over, the whole kingdom had gathered to listen and they too stood with cups filled with water. All of the people in the kingdom poured the water into the fountains and defeated the sandstorm. The hope in the story and in the people of the kingdom saved them from thirst. I think that this book would work well for either 4th or 5th grade students. This book has a very cyclical nature which would be interesting to explore with students. One of the main activities I would do in my classroom with this book would be to have students create their own story and then be the storyteller for the class or with a partner. Encourage students to think of stories that they may hear from their parents that they can pass down to others. Another activity that students could do with this folktale is to draw in sequence the events in the story. Drawing these events can help students understand the order in which they happened and the time period (story or real life) in which they are happening. I think that this activity will also allow students to see the main theme of hope in the folktale. Lastly, the book ends by asking what happened to the boy and the man replies, “that’s a story for another day.” From this, students could create their own story about what happened to the boy based on what they have learned about folktales. Evan Turk’s The Storyteller is a captivating folklore tale about the compelling art of storytelling. Even in this digital age, the creativity of storytelling is beginning to make a comeback and this beautiful book captures its heritage in the lifeblood of a village. In Morocco, the cool clear water once flowed alongside rich story tellers, but over time the water and the stories dried up – the storytellers were no more. One day, a boy in search of water found a storyteller instead of water at a Evan Turk’s The Storyteller is a captivating folklore tale about the compelling art of storytelling. Even in this digital age, the creativity of storytelling is beginning to make a comeback and this beautiful book captures its heritage in the lifeblood of a village. In Morocco, the cool clear water once flowed alongside rich story tellers, but over time the water and the stories dried up – the storytellers were no more. One day, a boy in search of water found a storyteller instead of water at a fountain. The storyteller began a tale and upon ending his story, the boy’s brass cup filled with water. The storyteller’s story was a story within a story, and it continued to the next day; the boy kept coming back to hear more and thus received more water. As this was happening, a desert djinn (a supernatural genie often found in Islamic mythologies), threated to take over the desert town – he could only be held back with water, which was all but completely dried up. The boy stalled the djinn with storytelling until the fountains began to flow again, thus defeating the djinn. This is a story within a story within a story, layered with beautiful storytelling and art-full pages. In the end, storytelling is the savior of the town and the boy becomes a gifted storyteller himself. Evan Turk is a skilled author and artist. The thoughtful location of this story taking place in Morocco is based on that region’s rich history of hlaykia, or public storytellers. This art form has been almost completely lost, but is starting to be rekindled in Marrakech. Turk delicately weaves his art through his story on these pages in details such as the diamonds that begin blue, turn brown as the water dries up, and back to blue as water flows again – searching for these details is half the fun. Evan Turk is the Ezra Jack Keats 2015 New Illustrator Honor recipient. 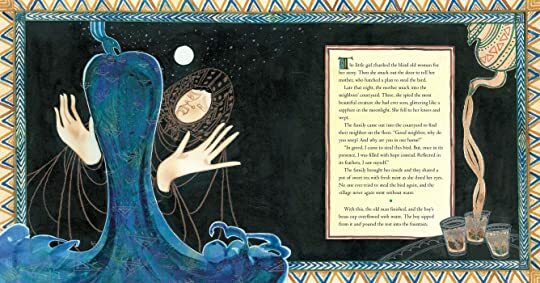 This would be an appropriate folklore read aloud book for children in kindergarten to fourth grade, as there are so many layers that could be explored in this book. The Storyteller could be used in the classroom in a number of ways. It easily creates a jumping off point as a way to learn about Morocco – its history, its food, its geography, etc. This could also be an opening book to exploring Islamic mythology, or mythology in general. A magic genie is a well-known character in many children’s popular folklore tales and is most likely a figure that children are familiar with. This book could also be one of several books to set children on a project of writing their own folklore story and potentially practicing an oral version of it. Finally, given Turk’s gift of art, students could likewise accompany (their own, or already published) folklore story with art that helped enhance the telling of the story. This book is beautiful, compelling, and brings up many points of discussion – I’d highly recommend it to classrooms! This book will show students the wonders and power stories can hold for not only a culture or nation, but also to learn lessons and knowledge from the stories. The book would be a great model text for students. It shows voice not just in the text of the book, but the art within the pages also tells a story of civilization. As a class, we would read and discussion the elements that make this a good example of voice and the power of storytelling. After that, students will random select a piece of This book will show students the wonders and power stories can hold for not only a culture or nation, but also to learn lessons and knowledge from the stories. The book would be a great model text for students. It shows voice not just in the text of the book, but the art within the pages also tells a story of civilization. As a class, we would read and discussion the elements that make this a good example of voice and the power of storytelling. After that, students will random select a piece of artwork from the board. I will just have then come up by rows. The artwork will range from Van Go's starry night to nature pictures to abstract shapes and a portrait of a civil war solider everything in between. The first thing you notice about this book is it's fabulous illustrations and how they are edge to edge, beautifully decorative. Exquisite. The story is about storytellers and the stories they told in the Kingdom of Morocco. Interwoven and interesting. Liked the story and the idea of storytelling, but the artwork is not my kind of thing. Lovely story with gorgeous artwork. My two year old nephew didn't appreciate it nearly as much as I did. I am always interested in finding books that allow students and children to have an imagination and creativity. This is a good book for these things because of the events that take place in the plot. It also allows many open ended questions for discussion! What a neat story (with a real-life background)! The illustrations are lovely - and in different styles depending on the story being told. There are several stories-within-stories in this book, and different colored text helps the reader to keep them straight. Be prepared to get sucked in, just as every listener in the book does! A story about the power of stories...seemed like mandatory reading for a librarian. While Turk's illustrations are absolutely beautiful, in the hands of a talented storyteller I can imagine the text really coming to life on its own. That being said, the pictures by themselves tell the story, too. Always a plus when both text and pictures can successfully stand alone. At 1st I wasn't a huge fan of this book-there was so much going on in the illustrations that it was distracting to me. But then as the story went on, I was drawn in and could relate to how stories give us life. Although I really enjoyed this book I am not sure it will be a big draw for my students due to its length and complexity of words. But all in all, it was a beautiful story! Stunningly gorgeous illustrations combined with a wonderful tale about the power of storytelling. I love this book. Evan Turk created elaborate, vibrant illustrations that made me wish I could somehow live in them. Just fantastic! I like the nested-storytelling technique used here; it keeps the reader involved in trying to keep everything straight. The art is full of sandy tones, reflecting the desert setting. Maybe a bit of a challenge for younger listeners, but older kids should enjoy it. Finally, a meaningful story. A story about traditions that were on the brink of death, but saved by a little boy to pass on to the next generations. Highlights Moroccan storytelling and weaving traditions. 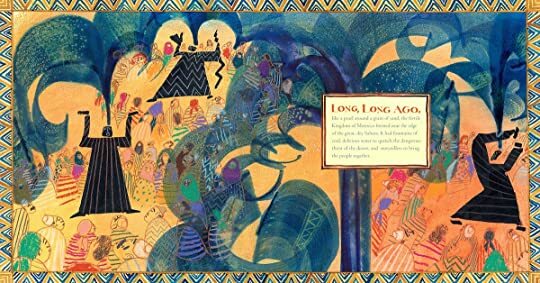 "Long, long ago..." begins this fabulous new folktale set in Morocco with fountains run dry, a storyteller, a boy, a girl, an old woman and a djinn. Written as a story within a story, the tone is magical and mystical and the illustrations are fascinating and perfect for the story. Evan Turk is an award-winning illustrator, author and animator living in Croton-on-Hudson with his husband, Chris, and two cats, Pica and Bert. A graduate of Parsons: The New School for Design, his illustration and animation have been shown all over the world. He grew up in Colorado and loves nature and being outdoors. He continues his studies with Dalvero Academy, a private illustration school in Evan Turk is an award-winning illustrator, author and animator living in Croton-on-Hudson with his husband, Chris, and two cats, Pica and Bert. A graduate of Parsons: The New School for Design, his illustration and animation have been shown all over the world. He grew up in Colorado and loves nature and being outdoors. He continues his studies with Dalvero Academy, a private illustration school in New York City. Evan loves to travel all over the world and learn about other people and places through drawing and the interactions that come from it.